In addition to the YouTube advert asking for applicants, they have also submitted traditional print applications (in the Sunday press), Have an active Twitter account, a YouTube Channel and Facebook page. All are updated regularly, all have great engagement. Users have been submitting applications to become the ambassador in YouTube. 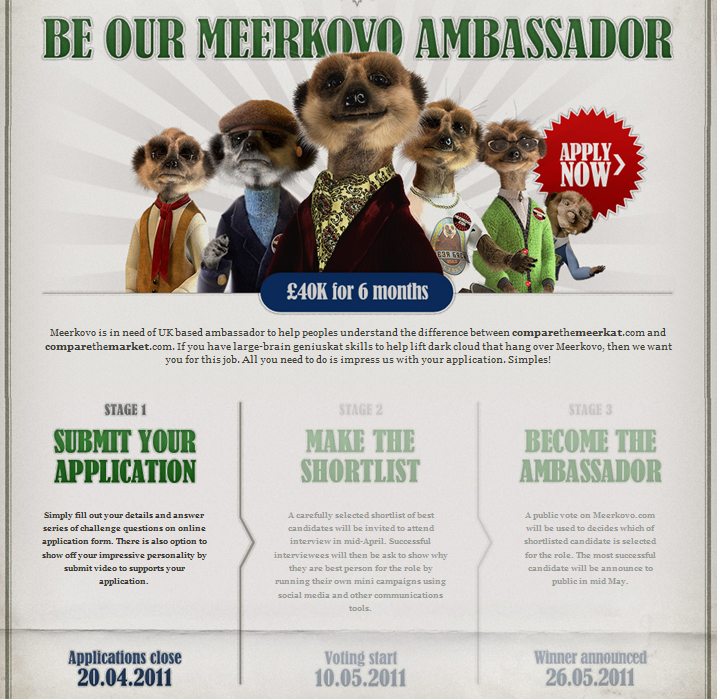 have a look at: http://youtu.be/08O1k0FxFok and http://youtu.be/Nq_jKsmpOj0 http://youtu.be/bEtbxUMxy6Q for a few examples or go directly to Meerkovo.com and complete your application form. Warning – applications close today! You might think that this is a little bit of overkill for advertising for a job at a company. This campaign, web estate and co-ordinated approach has cost quite a bit both in web design, time and effort to reinforce the message and find the perfect ambassador. And it’s only for a 6 month engagement. But look at the awareness that this has generated. There’s a virtual army of enthusiasts out there, keen to spread the message about the brand. Followers and friends will be exhorted to vote for each candidate – spreading the news even further. And the campaign is repeatable too. The engagement lasts for this year only. A guaranteed way to generate new clicks and raise awareness even further. This entry was posted in B2C, Branding, Business, Social Commerce, Social Media and tagged Aleksandr Orlov, B2C, Car insurance, Compare the Market, Compare the Meerkat, Meerkovo, social commerce, social media marketing on April 20, 2011 by eileenb.